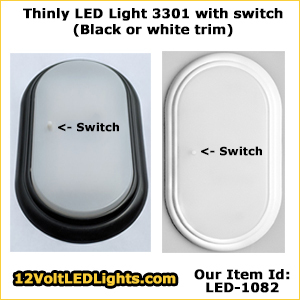 At 12VoltLEDLights.com, we offer FREE SHIPPING on LED lighting products including Bee Green LED Lights and 12 Volt LED Bulbs; and FriLight 12 Volt LED Lights from Sweden. Many of these classic light styles have been used in boats, RV coaches, trucks and vans since around 1990. Now, we are pleased to offer them with environmentally friendly power saving LEDs. Alternatively, for those of you with existing fixtures from FriLight or other manufacturers, most can be upgraded to LED by simply installing the appropriate style of 12 volt LED bulb. If you want to dim our LED lights or LED bulbs, a "PWM" (pulse width modulated) dimmer is required. For your convenience, we do offer a high quality PWM 12 volt LED dimmer. Alternatively, we offer 12 volt 3 way LED bulbs which can be "dimmed" (adjusted) simply by toggling your fixture or wall switch off and back on to step through the various light intensities. Based in Sarasota, Florida, we are an American owned and operated business. Our 12 volt LED lights (and 24 volt LED lights) are drop-shipped direct to you from the SalVinCo 12 volt LED warehouse, also located in Sarasota, Florida. FREE SHIPPING is offered on orders shipping within the USA (including Alaska and Hawaii), and approved territories including Puerto Rico and USVI. Shipping can be by UPS or Postal (in the US and Canada) or UPS (international) - select your preference when you check out.